can you try to replace your option.ini file (in this very folder) with this one ? Not sure what to do exactly. I found the option.ini file, but how do I replace it, and what with? Should I copy / paste that text in somewhere? Or just copy the link itself and paste that in somewhere? Right click on the link > Save link as... "option.ini"
Replace the old option.ini file with the one you downloaded and there you go. Now on your problem with Macs. The game doesn't work for you and I'm very sorry. Like I said before I agree that the game should be working for everyone and we're working to get there... What you don't seem to understand is that WAB (and WEE) works for a majority of Mac (and Linux) users. If you spent more time detailing what happens to you and less time threatening us we may have been able to solve it earlier. You haven't even posted your full specs... I understand that you would like to get updates everyday on what we're doing but I really can't see the point. We give you updates when we actually have something to say. You'd feel better if I answer every post you make and say "Sorry it's not working, we are trying to solve this." ? Since we were unable so far to reproduce the bug with the macs we have here some of us mac owners brought our own macs to the office yesterday. We only encountered problems with a ~2009 Mac Mini (2,4Ghz Dual Core, 2Go RAM, Nvidia320M). The game did crash on loading screen when we tried to use the autosettings. We managed to solve this problem and get the game to work, here are the steps. Please be careful with the folder you delete. 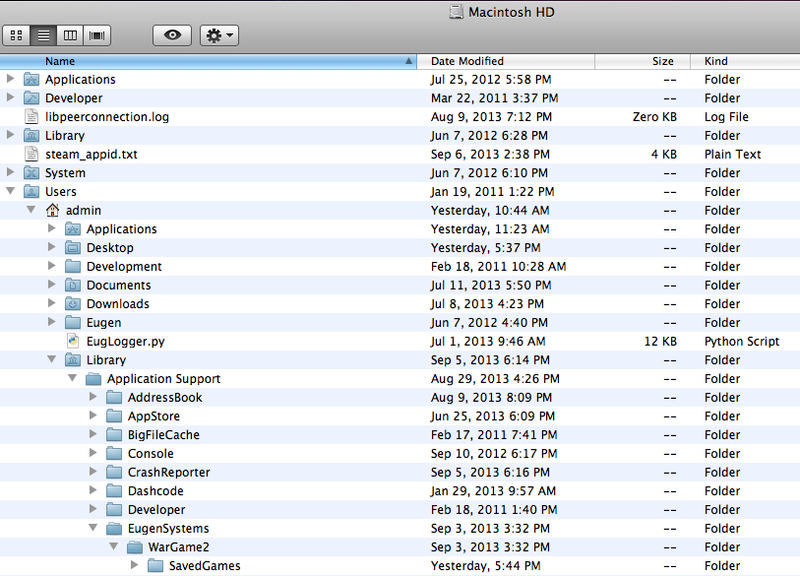 You have another Library folder under Macinthosh HD, you shouldn't find what you're looking for here. 2) Once you have deleted this, start the game and run the autosetting (Option > Video > Autosetting). If the game still isn't running properly, get back to me I'll have something else for you guys to try. -My game is up to date. -I launched the game, and clicked 'ok' when I was prompted to run the auto graphics settings. I am going to try this again, by restarting my computer, and turning off my anti-vious. Do note that I have tried running AB with my anti-virous off [as i do with EE] but so far there has been no discernible change. I will then try to use the changed "option.ini" file and will repost soon. So I restarted my comp, turned off the anti virus, and deleted the 'WarGame2' folder. This time when prompted to do the auto graphics, it did work, and this is the first time I have seen the auto graphics actually compleat without freezing on the loading screen. Though its for naught because when i tried the campaign it froze once more on the loading screen. Music plays, image stays still, I let it run for more than 16 minutes for good measure and then force quit, and of course there is no crash log. i'm now trying this and will be back soon. well copying and pasting didn't work, I tried to download the file from the link, but my computer wants to treat it as a .txt file an not as a .ini I'm having trouble getting it to work. When i launch the game it says game did not terminate properly & doesn't recognize the last configuration. anyways i tried deleting the "WarGame2" folder to try to get it to run the auto launcher again but it too just freezes again, i have no idea why it worked after i restarted. I'm gona go eat lunch and will check this again in a little while. I did everything exactly as you stated, but no dice. - I tried to run the autoset feature once more and yet again it froze, with me eventually force quitting. - Nothing seemed to have been changed however. The game froze on the loading screen like always. I don't know if the reports I've been generating so far have been helpful at all, but I can generate some more reports of these particular freezes if you believe they may be helpful. I am also adding a more complete specification of my Mac. If you keep on being disrespectful to moderators we will be forced to take action. Call it censorship if you like, like you said it "honestly I don't care". These guys are giving a hand with the forum and they're doing it well. If you have a problem with the way your Tech reports are being dealt with please refer to Eugen Staff. I couldnt possibly be more clear if i tried,i detailed all my issues and all my issues were the same as everyone elses. it freezes my computer ctrl alt esc. I posted my specs at least 3 times and once in the steam forum, Im sorry if you take what i say as threatening, I dont expect you to post daily as you put it to say sorry nothing works still but more than once every 3 weeks would be a start. Threatening is a very sensitive term, I give the respect i get in return as im sure most do, I just posted what i was actually doing in regards to my frustration so hopefully you could understand. I will take my complaints to the staff from here on. I tried everything you posted still frozen. Cannot produce crash log at this time. Game runs about 1 out 10 games. Thank you for your response and effort. I tried deleting the folder and running the auto-detection again. I did find the correct folder but the Auto Detection failed at 65%- it hung for several minutes and i had to force quit. I also tried the Option.ini file linked above. Still hung on loading screen like before. I've also tried the option.ini replacement tip now (plus, previously, deleting the Wargame 2 file), and it hasn't helped.